MN: Is it my time to talk yet? My next adventure comes out in October. I really don’t want to be rude, but it should be my time to talk. SS: Not yet. My next adventure comes out in September. You’ll get your time! MN: But you just had the limelight in August! SS: I can’t help it that Diane wrote my next adventure already. MN: Technically, she wrote my next adventure before your next adventure. SS: Yes, but your next adventure takes place in October, so it makes more sense for you to wait. MN: Or, we could tell these nice readers about each other. You know, what we have in common and why they should care about what happens to each of us. SS: That’s easy for you to say. You’re a forty-nine-year-old woman living in Texas who owns her own decorating business. You modeled your life after Doris Day. Everybody loves Doris Day, so everybody loves you. MN: Correction: I’m not forty-nine, I’m fifty. I had a birthday between my last adventure and my next adventure, so I understand you not knowing that, but it was kind of a big deal to me. SS: Oh, well, happy birthday! Did you get anything good? MN: I don’t want to talk about it. I’d be happy to talk about Doris Day if you want since I’m something of an expert, but you said this was your turn to talk, so let’s discuss you. You’re an expert on outer space uniforms, right? SS: Yes. I’m the uniform lieutenant for the Moon Unit Corporation. People think it’s not a particularly impressive job, but trust me, the person who controls the red shirts has more power than you know. MN: I would think so! What else do I know about you—you’re from another planet, and you’re lavender! SS: I do appreciate your attention to detail when it comes to things like color shades. A lot of people see me as purple. Colors are more nuanced than the color wheel, don’t you think? MN: As a matter of fact, I tried explaining that to Captain Tex Allen just the other day. 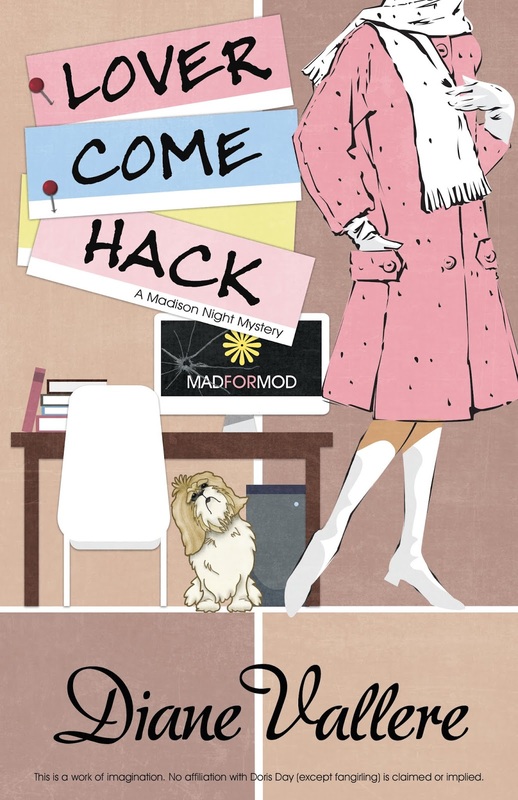 SS: I read about that in an advanced copy of LOVER COME HACK. That was funny! MN: Sadly, he didn’t find humor in the situation. 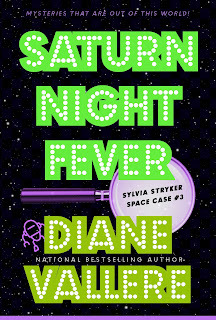 And I read an advanced copy of SATURN NIGHT FEVER, and without spoiling anything for the lovely readers out there, I will say that I enjoy how you interact with your mentor. He could learn a few things from you. SS: I agree—and I do believe I said that in the book. So, Madison, let’s talk decorating styles. You like the Atomic Era, and that’s what outer space looks like. You’d love it. MN: You know, for all of the estates I’ve bought out, I’ve never come across one of the Braniff Airlines space-age uniforms. You should search for them in the space academy databanks and recommend that your company reissues them. SS: Thank you for the suggestion. And if I were you, I’d run a sale on Sputnik lamps. In the future, they’re everywhere, and we have much better electrical wiring and remote illumination techniques. Yours will be obsolete in a hundred years. MN: I appreciate the vote of confidence in my lifespan, but I did just turn fifty. If I make it another fifty years, I’ll be lucky! SS: I have a feeling you’ll be around for a long time—as long as you can stay away from the criminal element. We both seem to have a problem with that. MN: Yes, indeed we do. Well, Sylvia, it’s been a pleasure spending time with you. Live long and prosper! SS: The feeling is mutual, Madison. Que Sera, Sera! Sylvia Stryker returns in SATURN NIGHT FEVER, coming September 18 and Madison Night returns in LOVER COME HACK, coming October 30. Whether you like a hint of the future or a hint of the past, these amateur sleuths have something for you! I'm intrigued by Sylvia's relationship with her mentor. Looking forward to reading both of these books.